The spectacular scenery of northern Vietnam is dominated by karst mountains and islands. The natural landscape here has been shaped over thousands of years by rice farming, either in vast, flooded plains that fill the horizon, or steep terraces in the mountains near China. Many itineraries for Vietnam feature Halong Bay as the premier site in the north. Halong Bay is beautiful, with its karst islands rising out of a misted sea, but it’s not the only place where you can sample the amazing uniqueness of this corner of the world. Alternative locations such as Sapa and Ninh Binh offer a greater diversity in showcasing the natural splendor of the north. Legend says that the thousands of islands in Halong Bay are the spines of a dragon’s back after he dived into the ocean. In some parts of the bay local people still follow their traditional way of life in floating villages, but the area is also the major tourist hotspot in Vietnam, with all that that entails. You can find boat tours here of any length and to suit any budget. Unfortunately, the bay is often affected by haze from pollution, which can lessen visibility. 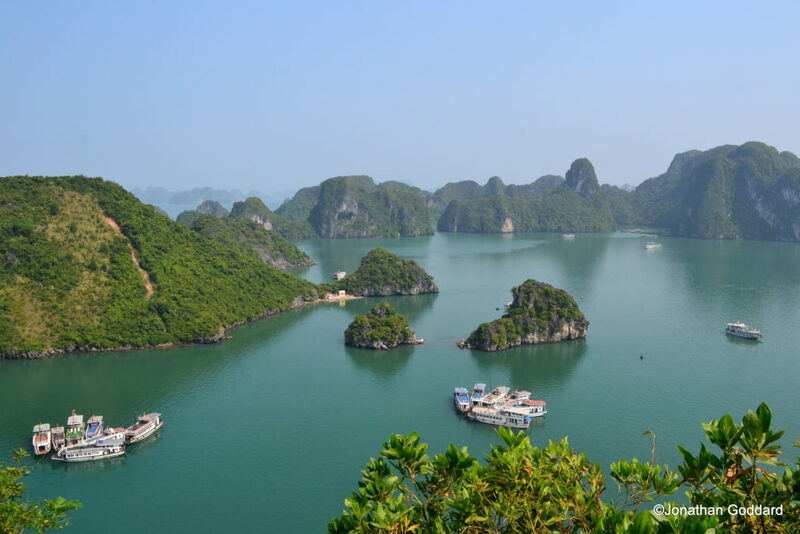 Expectations are always going to be high for anywhere as well-known as Halong Bay, but an increasing number of visitors to Vietnam are looking beyond its ‘must-see’ status. Vietnam’s north is so rich in dramatic scenery that you don’t have to look far to discover other options that can take your breath away. Sapa is a small town in the mountainous region surrounding the Vietnam-China border. 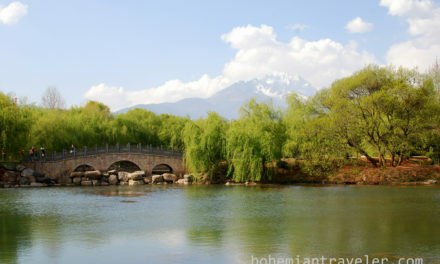 The town sits on a high plateau that faces Fansipan, the highest mountain in Vietnam (and indeed in all of Indochina). The views are incredible and easily accessible: you can see a lot just by walking through the town. 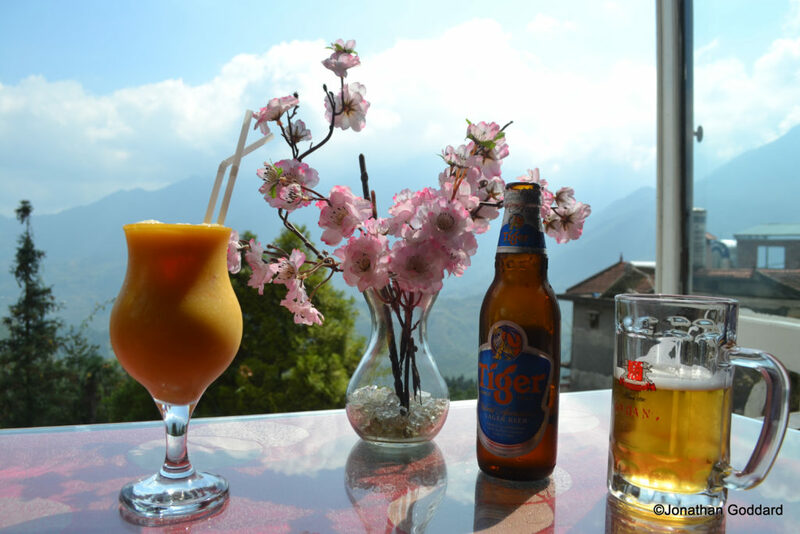 It isn’t hard to find accommodation in Sapa that looks directly out over the valley towards Fansipan, and enjoy drinks and meals in restaurants with incomparable locations. Within Sapa itself is the wonderful Ham Rong Mountain Park, situated on a peak above the town, and reachable on foot from the center. Ham Rong (which translates as Dragon Jaw) provides an opportunity to get up close to the nature of high-altitude Vietnam, in an area that is very close to southern China. The scenic region around Sapa is a perfect marriage between the amazing natural landscape and thousands of years of human cultivation. It’s an example of mankind’s influence having augmented and enhanced the beauty of nature. Endless terraces ratchet down steep-sided valleys and across low-lying plains, covering the landscape in a pattern of unique texture. Prepare yourself for misty blue mountains and endless vistas of rice terraces. Walking through the rice terraces at ground level makes you realize how sizeable each terrace is, and how much constant work each one requires to maintain and cultivate it. 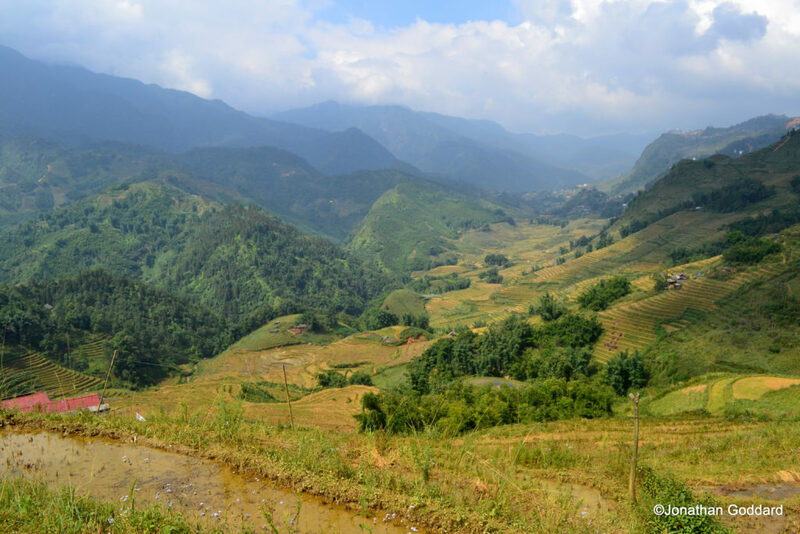 You can walk out of Sapa and down the mountainous paths to remote villages such as Lao Chai. This unforgettable trekking experience has breathtaking scenic views. Bac Ha is a remote town in Vietnam’s far north, a three-hour bus journey from Sapa along winding mountain roads. The Sunday market in Bac Ha sees local people coming from miles around to buy and sell all kinds of produce, from stem ginger to hand-embroidered bags to dogs and water buffalo. The colorfully clothed Flower Hmong tribe mingle with their animals in a picturesque setting surrounded by raw nature and pure mountain air. 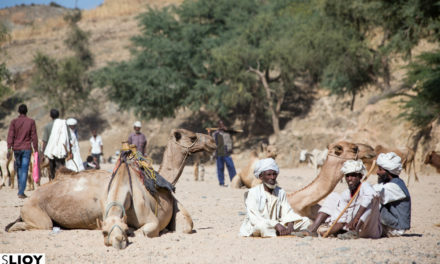 A visit here offers an insight into a way of life that has remained unchanged for centuries and has hardly been touched by the modern world. Lao Cai, the main access point for Sapa, is a border town. China lies just across the Red River here. You can go to the Vietnamese side and look across at the Chinese town opposite, but you can’t cross the Friendship Bridge without a Chinese visa obtained in advance. Ninh Binh itself doesn’t possess any special attractions but serves as a useful base for exploring the surrounding sights of Hoa Lu, Tam Coc, Bich Dong and the Mua Caves. The ancient city of Hoa Lu was once the capital of Vietnam, and it still has plenty of interesting old temples and monastic gardens. 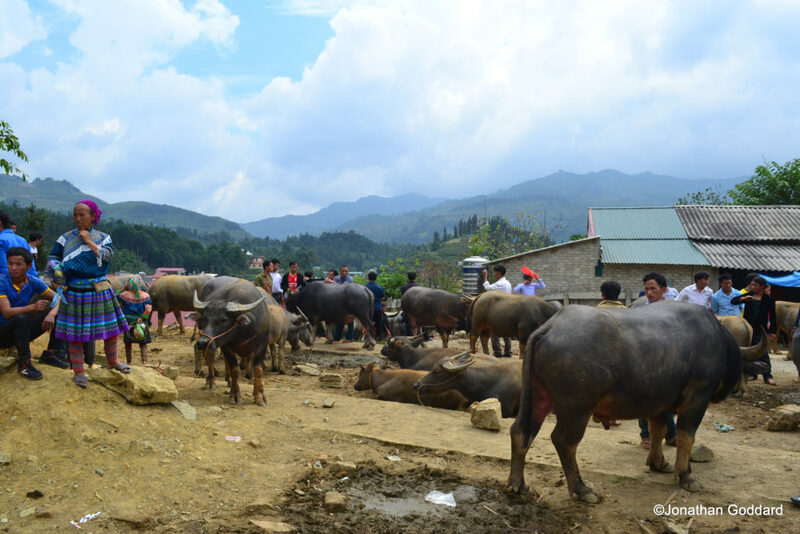 Water buffalo wander through the ancient capital and the surrounding hills offer great views. At Tam Coc a river meanders through rice paddy fields. You can take boat rides on sampans through the watery landscape. 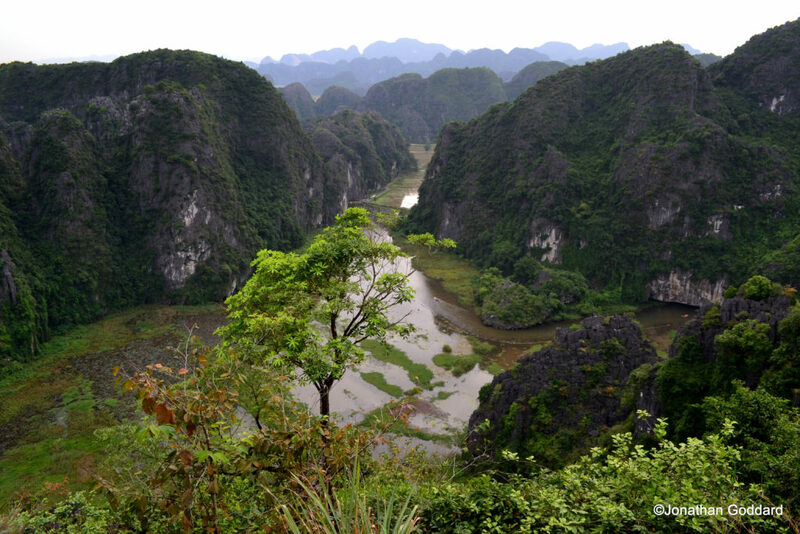 Karst islands rise up out of the flooded fields like a landlocked version of Halong Bay. 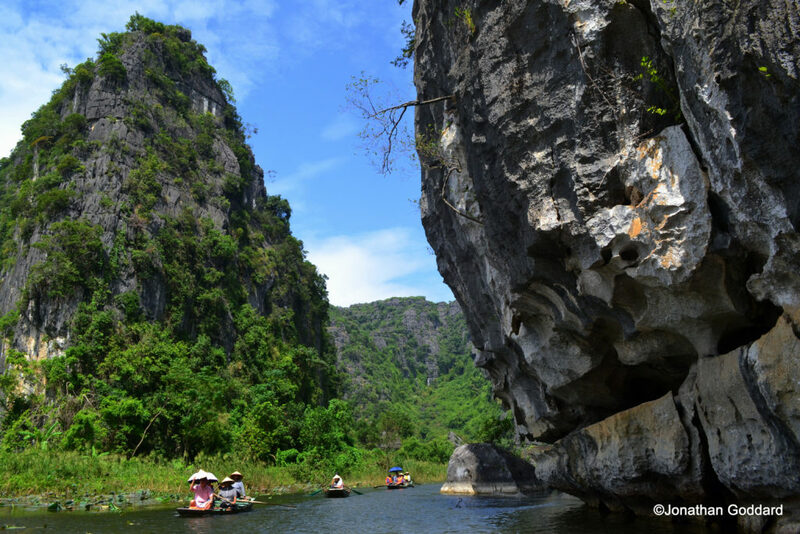 The rocky mountain peak containing the Mua Caves soars above the river at Tam Coc. High up the peak there are shrines inside the mountain caves, but the real draw here is the spectacular view. Climb up a crumbling stone staircase that winds its way steeply up the mountain to get panoramic views over the awe-inspiring scenery. The green and brown patchwork of a rice farming landscape stretches to every horizon, and is dotted with karst ‘islands’ that rise up dramatically from the flooded fields. 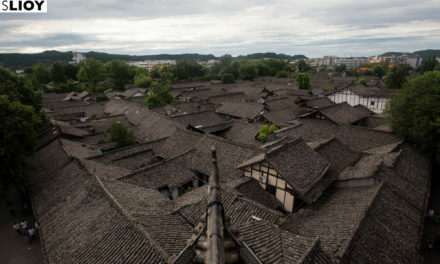 From this vantage point you also get an overview of the meandering river with its sampans below. 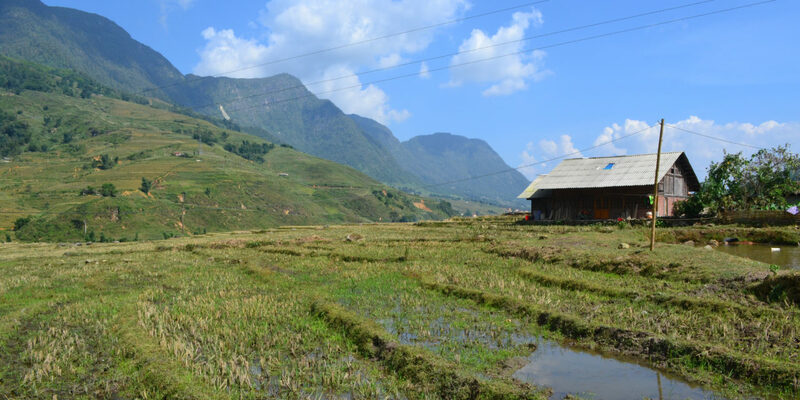 From Hanoi, you can take a sleeper bus directly to Sapa, or take the overnight train to Lao Cai, from where you can catch a connecting minibus on to the town. The train takes longer but makes for an interesting experience. Separate operators manage different tourist carriages on the train. You can buy train tickets online through 12go.asia. 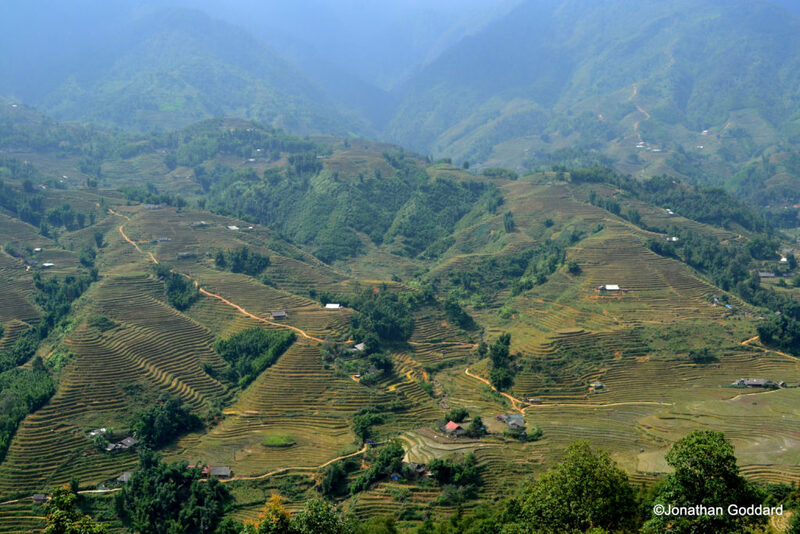 Once in Sapa, there are many tour agencies that can arrange treks and homestays, as well as visits to the market. Sapa O’Chau is recommended as it’s an ethical and reliable provider run by local Hmong people and provides opportunities for the community. Ninh Binh is easily reachable from Hanoi by train or bus. Jonathan Goddard is just back from four months travelling in Southeast Asia and Australia. When he's not out exploring the world and writing about it, he calls Cambridge (UK) home. See his latest writing and photography on his blog Dark Heart Travel and follow him on Instagram @darkheart_travel.